Did That Really Happen in the Previous Episode? Yes, yes it did. *still sobbing 4 seasons later over Ned's death* Yoren carries Arya away from the crowd and tells her to keep quiet and pretend she's a boy. To help her pass for one, he cuts her hair off. At Winterfell, Bran tells Osha that he dreamed that his father was in the Winterfell crypt. They go down there and find Rickon with Shaggydog. The youngest Stark reveals that he had the same dream. Once back outside, Luwin is carrying the message with the news from King's Landing and has the very sad task of breaking it to Bran. News has also reached Robb's camp, where the mood is terribly somber. The expression on Catelyn's face . . . just thinking about it makes me sad all over again. She finds Robb hacking at a tree with his sword. He swears that he'll kill all the Lannisters. His mother reminds him they still have his sisters, but once they get them back, then they will kill them all. He has a court singer's tongue cut out and then forces Sansa to look at her father's severed head. When Sansa gets smart with her mouth, Joffrey, not one to dirty his own hands, has Meryn Trant strike her in the face. After Joffrey and Trant walk away, the Hound, who gave her a cloth to wipe the blood from her mouth, advises Sansa to do what Joffrey says. The Northmen are debating whether or not to support Renly, who's declared himself king, or Stannis. The Greatjon proposes the North rule itself with Robb as king, and soon everyone is kneeling before King Robb. Catelyn goes to see Jaime, who acts like a class A a-hole toward her. After smashing him in the face with a rock, she demands to know how Bran fell out the tower. He confesses to pushing the boy but stops short of revealing why. So . . . Cersei is messing around with Lancel. Her cousin. Tywin is livid that Jaime is Robb's prisoner. In private, he admits to Tyrion that the latter was right—Ned was their bargaining chip to get Jaime back, and now, thanks to Joffrey, they've got nothing. Tywin is marching for Harrenhal, while a shocked Tyrion is ordered to King's Landing to be Hand of the King while his father wins the war on the battlefield. Tyrion is not, however, to bring Shae to Court. Daenerys wakes up to the sad news that her son did not survive. Mirri Maz Duur reminds her of the bargain she made to save Drogo. Daenerys demands to see him, and once outside of her tent, discovers that most of the khalasar is gone. Drogo is only a shell of a man. Daenerys confronts Mirri Maz Duur about knowing exactly what would happen when they made their deal. Jon is deserting the Night's Watch to find Robb and fight with him. Sam tries to stop his friend, but Jon is determined. It's not long, though, before Pyp, Grenn, and Sam, led by Ghost, catch up to him. The three remind him of the vows that he took. Daenerys tries talking to Drogo, hoping for a response, but there is none. She finally accepts that he'll never be himself again and smothers him with a pillow. We learn a few interesting things about the old geezer: he likes the company of prostitutes and he's spry enough to do squats! 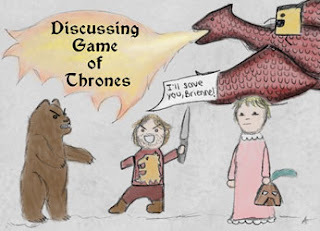 It's time for another Littlefinger/Varys conversation/insult-fest! Arya is preparing to leave King's Landing for the Wall with the other boys and men destined for the Night's Watch. Two of the boys, Hot Pie and Lommy Greenhands, notice Needle and try to wrest the sword from her. She threatens Hot Pie with the weapon until Gendry, who's also part of the group headed for the Wall, shows up and chases the boys off. Mormont knows about Jon's midnight near-flight. The White Walker situation is getting very serious, and Mormont wants Jon and Ghost, if Jon's loyalty is truly to the Night's Watch, to ride out with the party that the Lord Commander himself is leading beyond the Wall to assess the threat. I just love that shot of the Night's Watch riding off! Daenerys stands before a funeral pyre for Drogo. The dragon eggs are going into the fire, and so is she. Jorah begs her not to do it, but she insists that she knows what she's doing. And wow, is she ever right! The next morning, she emerges from the ashes miraculously unburnt and with three baby dragons! Rewatching the first season four years after the show premiered has only made me appreciate it and love it even more than when I first saw it. In only ten episodes, a whole lot of story gets covered; not exactly easy to pull off, but it's done extremely well here. The characters are superbly cast, and I really, really, really miss Sean Bean as Ned Stark. I can only imagine what it was like for viewers who didn't know Ned's fate beforehand and found out when they watched the "Baelor" episode. It's hard for me to choose a favorite episode, because really, each one was just amazing. But I'll tell you what one of my favorite scenes was—in Episode 10, "Fire and Blood," when Jaime says, "There are no men like me. Only me." I realize that he's pretty despicable at this point, but I still love that line. Time to start binge rewatching Season 2! George sure knows how to take his characters through the ringer and them kill them off. I will never forget the King in the North scene from the book and the tv series. It is one of my favorite scenes ever and I still get chills from it. Though Robb is young, he is smart and clever and dedicated. I couldn't think of anyone more deserving to be declared King in the North. Good for him! And that scene with the Night's Watch leaving to go beyond the wall, love that as well! And Dany and her dragon hatchlings was so full of awesome! All day yes to that scene! Onto season two! My cousin is a huge GoT fan, too, and we read the books together, and we were both like, YEAH!!!! when the Night's Watch rode off. And the dragons hatching was such a perfect way to end both the first book and the first season of the show! I'm jealous that you have someone close to you that loves the books and the series just as much as you do. While I have my sister loving the series, she is not a big book reader so I cannot share those with her really. I have already read the first three books three times and the last two twice. I'm sure before it's all said and done I will have ended up reading them all again! I read the books about 4 years ago, and I'd love to do a reread eventually. I know that I missed a ton of important clues the first time around.